If cruising is teaching me just one thing, it’s geography. I’m amazed at the knowledge we are gaining about something as simple as the names and locations of countries. For the South Pacific planning, we are using three books: Landfalls of Paradise, South Pacific Anchorages, and of course, our always handy World Cruising Routes. Landfalls of Paradise is my favorite so far. We’ve also had other resources. When we joined the Pacific Puddle Jump, we received a hard copy of their brochure, Stopover Handbook in French Polynesia, which is by far the nicest brochure I’ve ever seen printed solely for cruisers. It’s got a great map in the back, which shows the islands and island nations boxed together. Finding these places on Google Maps in relation to each other is so difficult because they are so far apart that the labels go away. Additionally, there are many people who have cruised extensively in these areas. This run, generally from French Polynesia to Australia or New Zealand, is called the Coconut Milk run. S/V Soggy Paws has written/compiled several guides for the Pacific. Another boat, Jacaranda, has written a very handy guide to food availability in French Polynesia. 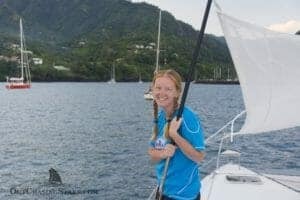 On the website of the famous Beth Leonard and Evans Starzinger (authors of such classics as the Voyager’s Handbook) there is a guide written by S/V Felicity, but it’s a bit outdated. 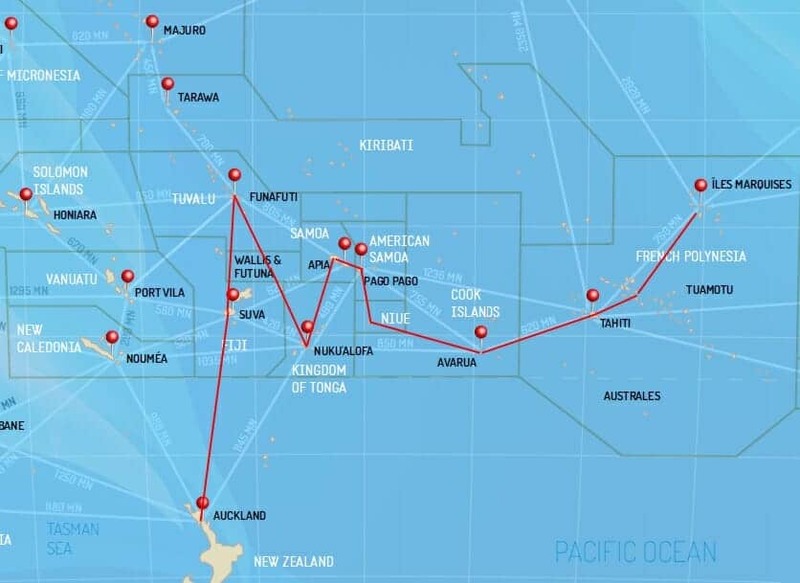 And of course, I’ve been following blogs of boats that are ahead of us, like Escape Velocity, who arrived in French Polynesia in April 2015 and are now in New Zealand, and Del Viento, who arrived in French Polynesia in May 2015 and are now in Tonga. I enjoy both of these blogs for the details – it helps me envision myself there, and although our experiences are rarely ever the same, it gives me a bit of confidence knowing I’ve read what others have done here. The South Pacific is broken into three island groups: Polynesia, Melanesia, and Micronesia. Our plans for this year will take us through most of Polynesia and parts of Melanesia. Within Polynesia, there are about 15 island groups, and those vary from independent nations (like Samoa, Tonga, and Tuvalu) to territories (like French Polynesia and American Samoa) to dependencies (like Tokelau – what does that even mean??) and collectivities (Wallis and Futuna, and ditto). To start, we hope to be arriving in French Polynesia by May 7th ( that’s assuming 20 days in the Galapagos and 21 days at sea). French Polynesia (FP) is devided into five archipelagos. The north-eastern most is called the Marquesas islands (12 islands and 8,600 people). We will clear in at Hiva Oa. Next, and the largest by square mileage, is the Tuamotus. The Tuamotu Islands are 76 atolls, with only 16,000 people living there. Next, the Society Islands include the most famous FP islands – Tahiti and Bora Bora. Tahiti is the largest island in FP and has a population of 170,000. We will aim to arrive in Tahiti June 5th, where we will leave Starry Horizons to come back to the states for a wedding. Sadly, we will probably not make it to the southern most FP archipelagos, the Austral and Gambier Islands. The order of these islands will really depend on the wind. Typically, during the summer months the winds are from the southeast. In order to avoid sailing upwind, we will try to sail southwest or north. And, as our destination is New Zealand, we don’t want to get too far west. We expect we will leave for New Zealand from Fiji. We have about five months between returning from the states and getting to New Zealand. It kind of sounds like a long time….but then you look at how much group we have to cover! We only have 1 week of guests onboard planned, which is in Tahiti. There are a few good places that we could have a guest fly in, like American Somoa or Fiji….wink wink hint hint! A big part of my planning is provisioning. I bought a lot of the major dry goods in Panama – paper towels, toilet paper, chips, peanut butter. One complication is that with leaving Starry Horizons in Tahiti, we want to have our fridge and freezer empty so we can turn them off and not drain our batteries. It sounds like we can find almost anything in Tahiti – for a price – and Raratonga (Cook Islands) is also great for provisioning. In the Galapagos, I did find plenty of produce, and was able to buy cured meats (Serrano jamón and sausages) plus frozen chicken leg quarters. There is plenty of seafood too, but I’m hoping we will have productive fishing out at sea. I love this part of cruising; learning and dreaming about where we go to next. 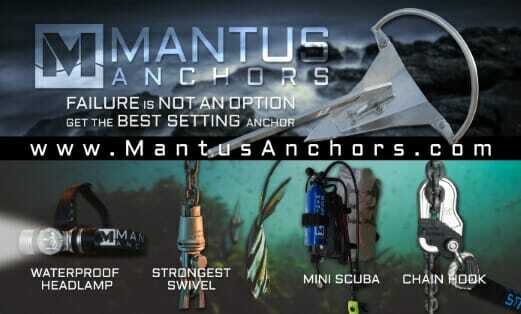 Right now I’m dreaming of swimming with mantas, eating pamplemouse, and buying black pearls. Just one of many possible routes for the Coconut Milk Run. You guys continue to amaze! What a vast ocean area the South Pacific is. I’m sure very few people experience it like you are. Thanks again for sharing your adventures so we can vicariously learn about this beautiful planet and places that the wind blows. Stay safe and be well. Glad you are following along uncle Phil! There’s a lot to explore out here for sure! Boy, I thought you were retired! You sound busier now, than when you were working! Love the geography lesson but “love” even more that you are coming to the wedding!!! See you soon baby brother!!!! Hmm…not sure if we are who you think we are? David is not a baby brother…. Wow wee zow wee! Thank you for the geography lesson. So glad to see what you are up to. Makes our exploration of the east side of Martinique look pretty lame (thought we are happy w it). So glad to read about your plans. It all sounds fabulous. Do y’all ever sleep? Or does a 19 day passage give you a lot of research time? Do you store everything in advance so you can read while passaging? Hugs to you both from us. I did all this research in Panama really. Mostly on the passage over I read SO MANY BOOKS!! I hope you enjoyed Martinique…no matter where you explore on your boat, it’s king to be awesome!